Every search expert I have ever talked to agrees that it is just good common sense to find relevant information by using every search method that you can. It makes no sense to limit yourself to any one search method. They agree that multimodal is the way to go, even if they do not use that language (after all, I did make up the term), and even if they do not publicly promote that protocol (they may be promoting software or a method that does not use all methods). All of the scientists I have spoken with about search also all agree that effective text retrieval should use some type of active machine learning (what we in the legal world calls predictive coding), and not just rely on the old search methods of keyword, similarity and concept type analytics. The combined multimodal use of the old and new methods is the way to go. This hybrid approach exemplifies man and machine working together in an active partnership, a union where the machine augments human search abilities, not replaces them. 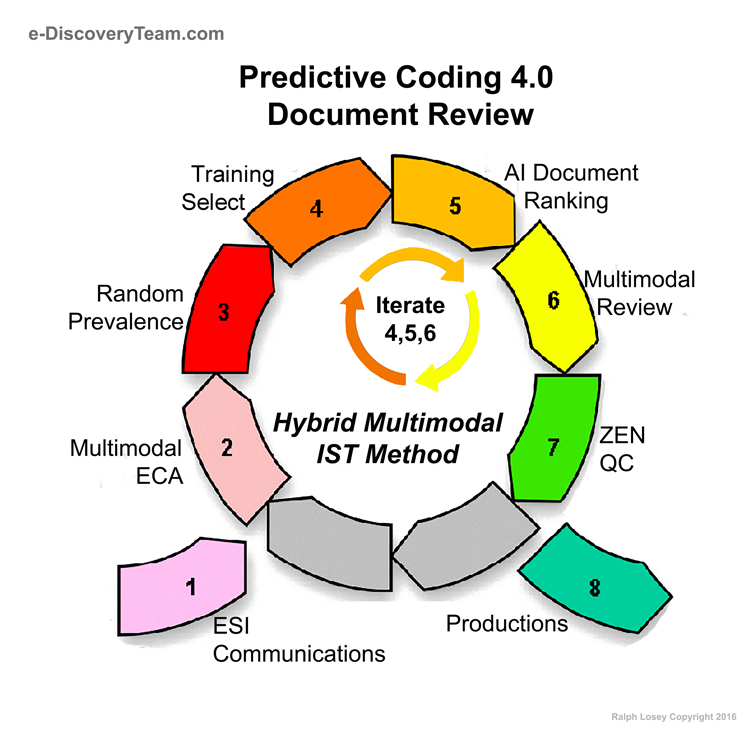 The Hybrid IST Multimodal Predictive Coding 4.0 approach described here is still not followed by most e-discovery vendors, including several prominent software vendors. Instead, they rely on just one or two methods to the exclusion of the others. For instance, they may rely entirely on machine selected documents for training, or even worse, rely entirely on random selected documents. They do so to try to keep it simple they say. It may be simple, but the power and speed given up for that simplicity is not worth it. Others have all types of search, including concept search and related analytics, but they still do not have active machine learning. You probably know who they are by now. This problem will probably be solved soon, so I will not belabor the point. 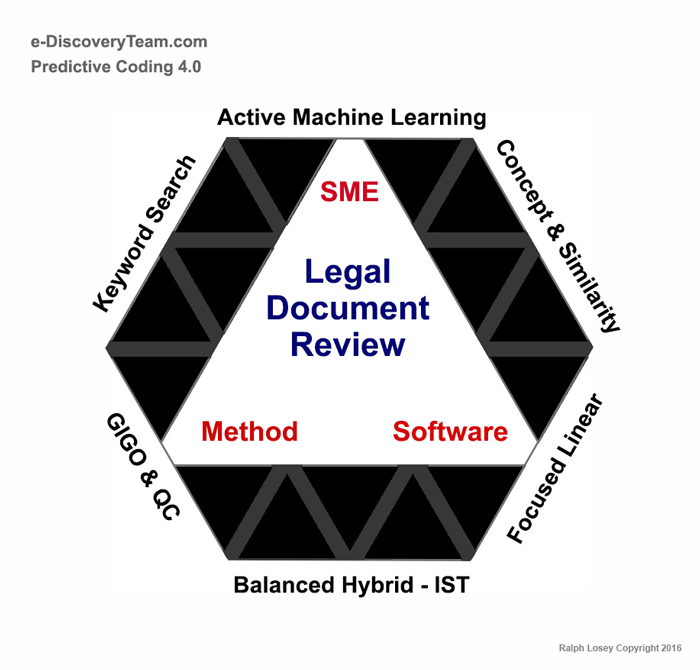 The users of the old software and old-fashioned methods will never know the genuine thrill known by most search lawyers using AI enhanced methods like Predictive Coding 4.0. The good times roll when you see that the AI you have been training has absorbed your lessons. When you see the advanced intelligence that you helped create kick-in to complete the project for you. When you see your work finished in record time and with record results. It is sometimes amazing to see the AI find documents that you know you would never have found on your own. Predictive coding AI in superhero mode can be exciting to watch. 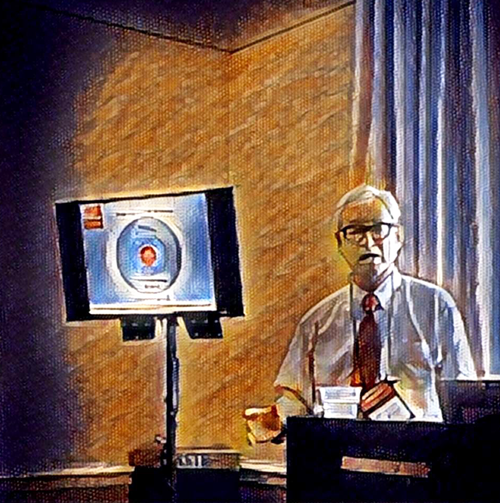 My entire e-Discovery Team had a great time watching Mr. EDR do his thing in the thirty Recall Track TREC Topics in 2015. We would sometimes be lost, and not even understand what the search was for anymore. But Mr. EDR knew, he saw the patterns hidden to us mere mortals. In those cases we would just sit back and let him do the driving, occasionally cheering him on. That is when my Team decided to give Mr. EDR a cape and superhero status. He never let us down. It is a great feeling to see your own intelligence augmented and save you like that. It was truly a hybrid human-machine partnership at its best. I hope you get the opportunity soon to see this in action for yourself. Our experience in TREC 2016 was very different, but still made us glad to have Mr. EDR around. This time most of the search projects were simple enough to find the relevant documents without his predictive coding superpowers. As mentioned, we verified in test conditions that the skilled use of Tested, Parametric Boolean Keyword Search is very powerful. 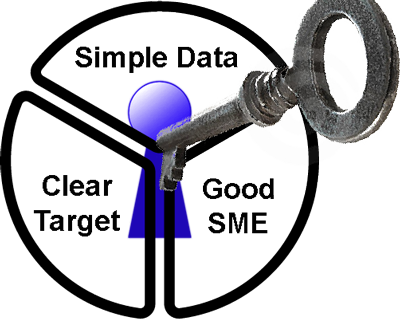 Keyword search, when done by experts using hands-on testing, and not simply blind Go Fish keyword guessing, is very effective. We proved that in the 2016 TREC search projects. As explained in Part Four of this article, the keyword appropriate projects are those where the data is simple, the target is clear and the SME is good. Still, even then, Mr. EDR was helpful as a quality control assistant. He verified that we had found all of the relevant documents. 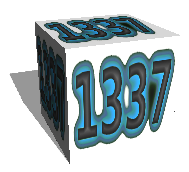 Bottom line for the e-Discovery Team at this time is that the use of all methods is appropriate in all projects, even in simple searches where predictive coding is not needed to find all relevant documents. You can still use active machine learning in simple projects as a way to verify the effectiveness of your keyword and other searches. It may not be necessary in the simple cases, but it is still a good search to add to your tool chest. 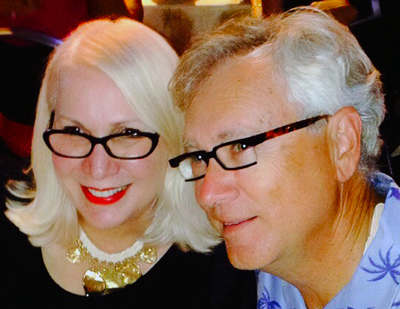 When the added expense is justified and proportional, the use of predictive coding can help assure you, and the other side, that a high quality effort has been made. The multimodal approach is the most effective method of search. All search tools should be used, not only Balanced Hybrid – IST active machine learning searches, but also concept and similarity searches, keyword search and, in some instances, even focused linear review. By using some or all search methods, depending on the project and challenges presented, you can maximize recall (the truth, the whole truth) and precision (nothing but the truth). That is the goal of search: effective and efficient. Along the way we must exercise caution to avoid the errors of Garbage in, Garbage Out, that can be caused by poor SMEs. We must also guard against the errors and omissions, low recall and low precision, that can arise from substandard software and methods. In our view the software must be capable of all search methods, including active machine learning, and the methods used should too.